How challenging it can be the life on ever changing conditions of the Himalayas? Surprisingly, the highest mountain range in the world nurtures an amazing diversity of life. Many amazing species of animals, birds, reptiles, amphibians and fishes live in the Himalayas. Here the list of 7 most amazing animals of the Himalayas. The wild boar is a widely distributed mammal that found throughout the Asia, Northwest Africa and Europe. There are 16 different subspecies of wild boar in the world. Wild boars can thrive in different types of habitats. They can even find in the Himalayan range. The wild boars found in the Himalayan range of India have a grayish-black coat. The wild boars are medium-sized mammals. An adult wild boar has a length between 4-6.5 feet and weighs up to 200 kg. 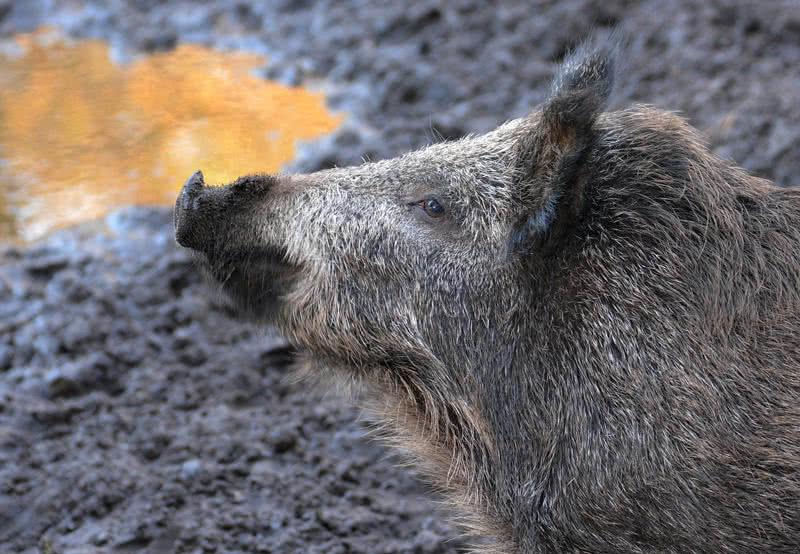 The thick coat of wild boars comes in different colors including brown, black, grey or red. The most noticeable feature of a wild boar is a pair of tusks on the lower lip. The tusks of male wild boars are longer than the females. During mating season, from November to January, the male wild boars fight each other using their tusks to get the female. The wild boars live in groups that have members between 10-30. They are nocturnal animals and spent day hours in sleeping. They spent around 10-12 hours in sleeping during the daytime and only come out at night to find food. Wild boars are omnivorous and they feed on berries, nuts, roots, insects and carrion. The Himalayan blue sheep is a high mountain sheep that found in the Himalayan ranges of India, Nepal, China and Pakistan. In India, they called as ‘Bharal’ and in Nepal their name is Naur. The Himalayan blue sheep prefer to live in rocky hills at an altitude of 4000-6000 feet above sea level. The Himalayan blue sheep have a body length between 3.8-5.5 feet and weigh up to 75 kg. They have a short, dense coat that comes in greyish color with a blue tint. This unique coat color let them hide against the Himalayan rocks. On facing a threat from predators like snow leopard, the Himalayan blue sheep use this camouflage trick. They remain motionless to blend with the rocky surroundings. thus, it becomes difficult for the predator to spot the sheep. The Himalayan blue sheep found in herds that contain 10 or more members. They prefer to roam in high mountains where plenty of grass is available. The Himalayan blue sheep are mainly grazers. But they also feed on herbs and shrubs when the grass is scarce at the mountain slopes. 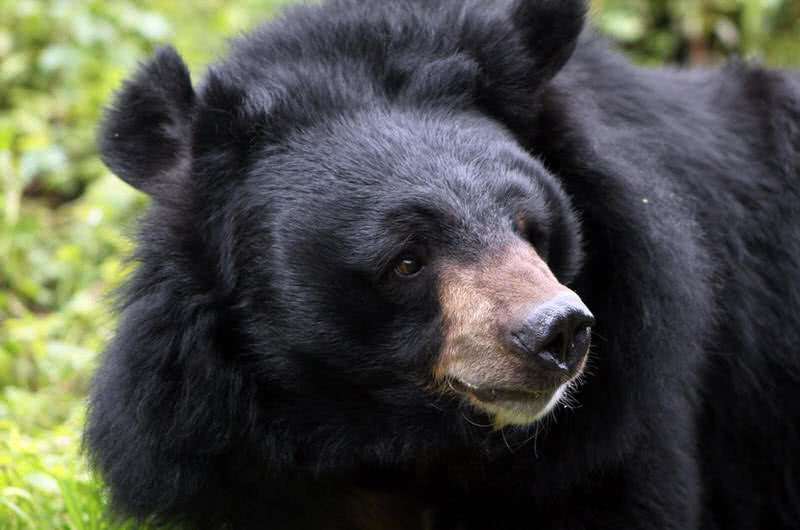 The Himalayan black bear is also known as Asiatic black bear that found across the foothills of Himalayas, Southern China, Myanmar, Southern Russia and Afghanistan. Due to deforestation and hunting, the population of Himalayan black bears have decreased dramatically. The International Union for Conservation of Nature has been classified this species as vulnerable. The Himalayan black bears are medium to large sized bears. Normally, an adult Himalayan black bear has a body length between 54 to 65 inches and weighs up to 120 kg. They have a beautiful black coat with yellow crescent on the chest. These amazing bears have been hunted for decades specifically for their skin and gall bladder. The Himalayan black bears are efficient climbers. They spend most of the daytime on tree branches. They also built nests in the trees by folding the branches. The Himalayan black bears spent the summer season in high regions, at an altitude of 10000-12000 feet. But on the arrival of winter, they descend to the lower level of their habitat. The Himalayan black bears hibernate throughout the winter. So that, before the arrival of winter they eat food with high fat content to add extra layers of fat to their body. The Himalayan black bears are omnivorous animals. They feed on small animals, honey, nuts, fruits and roots. The Himalayan monal is a stunning colorful bird of the pheasant family. This beautiful bird found in the Himalayas, from Afghanistan to Nepal to Northeast India. They inhabit in open or mixed forests. Himalayan monal is also the National bird of Nepal. It is a high-altitude bird, prefer to live in high mountainous slopes at a height of 6880 to 14800 feet above sea level. 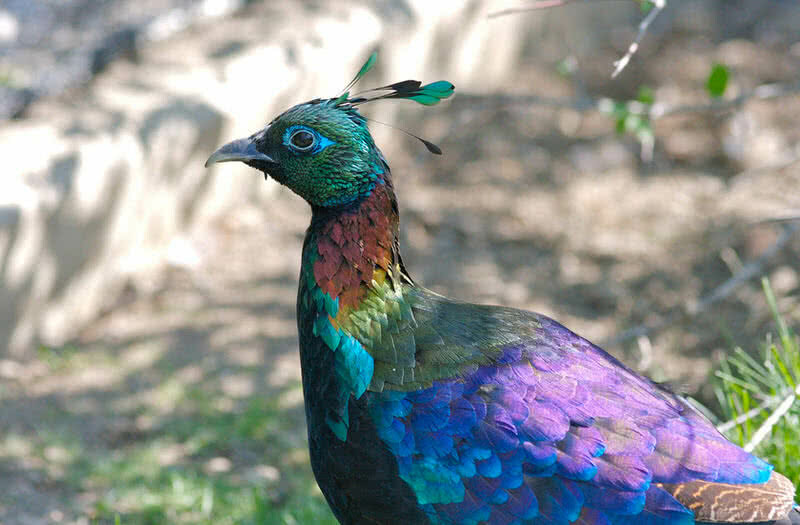 The male Himalayan monal is known for its striking plumage of different metallic colors including blue, green, purple and red. They often called as ‘nine colored bird’ because of its stunningly colorful plumage. The metallic green crest is the another noticeable feature of the male monal. They also have reddish-brown neck, bluish black wings, and purple back. The female Himalayan monals are not so colorful as male birds. They have an overall brownish-black appearance. The female monals also have the crest like the male birds. But it is small and brown in color. The Himalayan monals use different calls to communicate with other birds in the group. During mating season, the male monal uses their calls and body display such as bobbling of the crest and fanning of tails to attract the female bird. 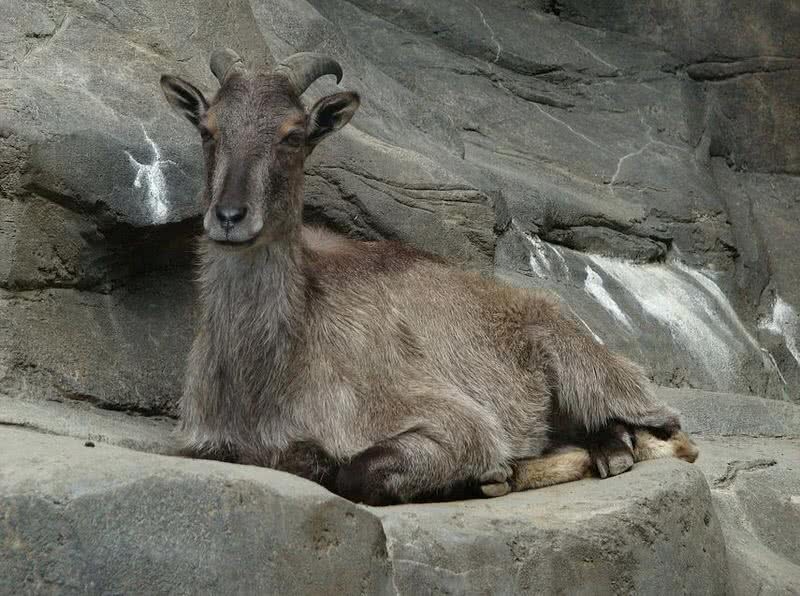 Himalayan Tahr is a relative of the wild goat. They are native to Himalayan ranges of Northern India, Nepal and Southern Tibet. 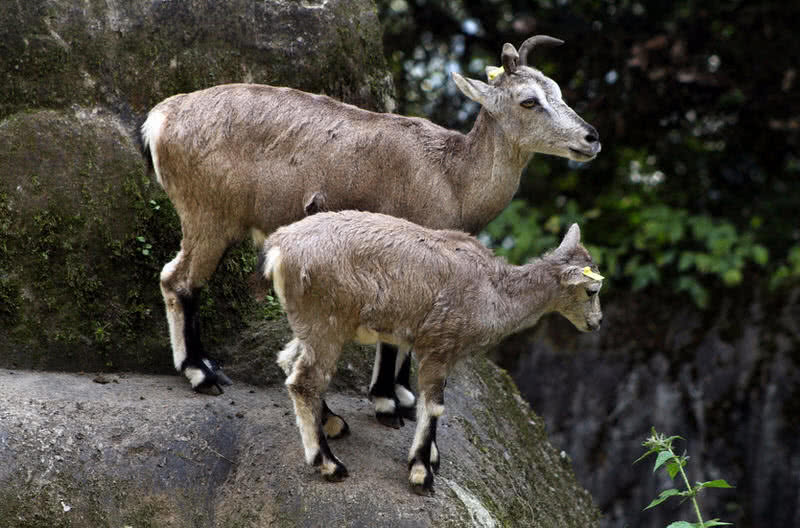 The Himalayan Tahrs are perfectly adapted to life in the high mountain slopes and wooded hills of the Himalayas. They have long, dark brown upper coat with a thick undercoat. It keeps their body remain warm in the cold weather. In spring, their coat becomes thinner and lighter in color. Thus, the Himalayan Tahr can perfectly regulate the body temperature in all seasons. The hooves are another great feature of the Himalayan Tahr. The hooves have smooth, rubbery cores that provide excellent grip. So that the Himalayan Tahrs can easily walk across the steep mountain sides. The Himalayan Tahr can grow up to 4-5.5 feet in length and 36-85 kg in weight. They also have beautiful triangular shaped horns that have a length up to 18 inches. The horns of females are smaller than male Tahrs. 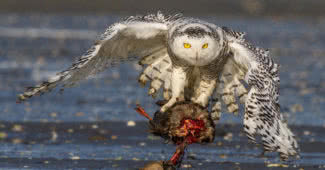 The males use their strong horns to fight with each other to get the female. During the daytime, the Himalayan Tahrs graze and rest on high hills. They form the herd that contains 20-60 Tahrs. On sensing the threats, they run quickly along the steep mountainsides. Their diet mainly includes grass, herbs and shrubs. The red panda is a domestic cat sized mammal with a big bushy tail. They found temperate forests of the Himalayas. According to International Union for Conservation of Nature Red panda is a threatened species. Only less than 10000 red pandas left in the world due to habitat loss, fragmentation and poaching. 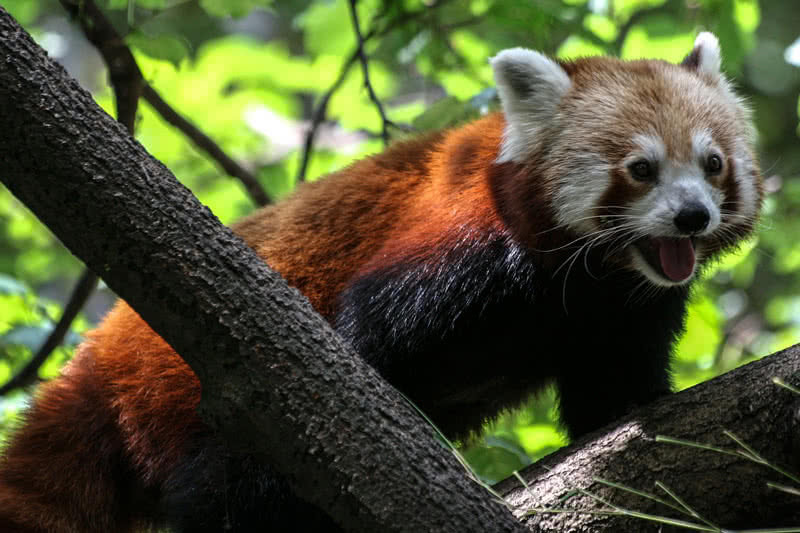 The red pandas measures 20-25 inches in length and 4-62 kg in weight. They have very attractive long reddish-brown fur. The most noticeable feature of the red pandas is their long bushy tail which have a length between 11-20 inches. Their big tail also has an alternate light and dark rings. The red pandas are nocturnal animals. They spend the day hours in sleeping on the tree branches and only come down at night for finding the food. This night time foraging help the red pandas to avoid threats from potential predators like snow leopards. Unlike the giant pandas, the red pandas feed on a variety of food, including berries, plant leaves, roots, bird eggs and acorns. The snow leopard is probably the most amazing animal found in the Himalayas. This beautiful gray leopard can be found in the Indian Himalayas and other rocky mountains of Central Asia. The snow leopards are specially adapted to the life on harsh environments of the Himalayas. The thick gray hair of snow leopards can perfectly balance the body heat in all seasons. Generally, an adult snow leopard has a length between 30-50 inches and weigh up to 75 kg. Their body and legs are so powerful. So that they can easily climb the steep mountain slopes. On a single jump, the snow leopards can pass a distance of 15 meters. The long tail also gives them perfect balance. The paws of snow leopards are also perfectly adapted to walk in the snow. Their paws are wide and undersides are covered with fur. It also minimizes the heat loss and provide the perfect grip to walk on the-the steep slopes. In summer, the snow leopards can be found at an altitude between 2500-6000 meters. In winter, they will descend to the lower level of the mountains. 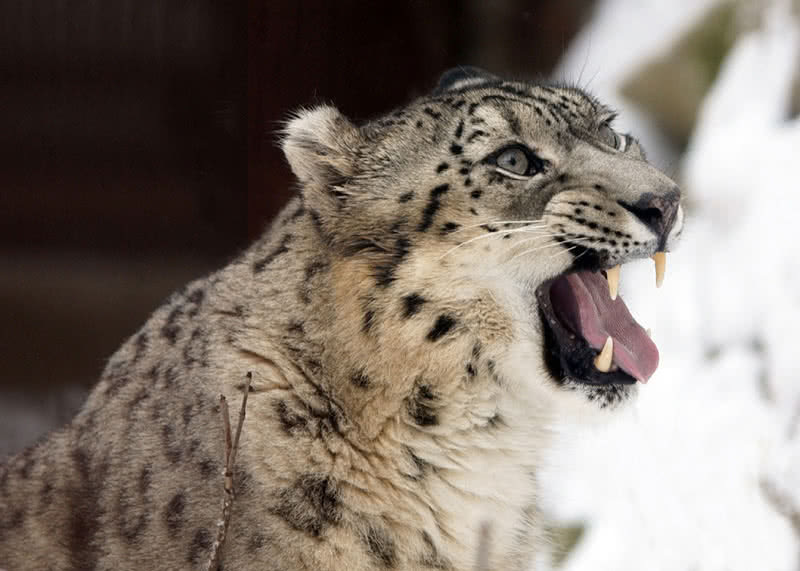 The snow leopards are powerful predators. In the Himalayan region, they mainly prey on blue sheeps, marmots and hares. Despite its harsh environments, the Himalayas are home to many amazing species of animals. They are perfectly adapted to life in the challenging conditions of the Himalayas. The above is only a short list of animal life in the Himalayas. Feel free to share your knowledge about this topic in the comment section below.